Like my multi-colored room? It really captures the mood I'm going for. I haven't gone crazy, don't worry. 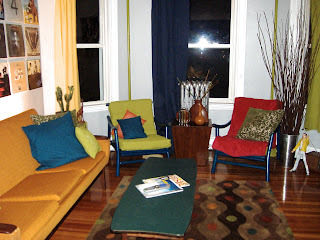 I'm just trying to decide what colors to do the curtains and chairs in. I'm definitley over the whole yellow thing, and thought either blue, green or red might be the way to go. Of course, being the professional photographer that I am, I managed to not even give you a good glimpse of the green curtain...my bad! Right now, the green has the majority of the votes. It's my favorite as well so hopefully I'll get those up soon. Red is winning for the chairs. Of course the red in the chairs is NOT the color I would choose to use, but I have yet to find the perfect fabric so that blanket is being used as a stand in. The pipes care going to be repainted in orange to bring the couch color over to that wall. 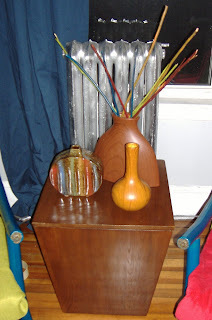 Below are a few of the items I picked up on my trip to Cardi's furniture out on the Rhode Island border. It's a fun (albeit long) drive if you have time to kill one weekend. Cardi's is a part of the Rhode Island Design Center so you get great help from all of the designers working there. Out of the people we worked with, Tad Bronner seemed to be the best so be sure to check for him up on the third floor. 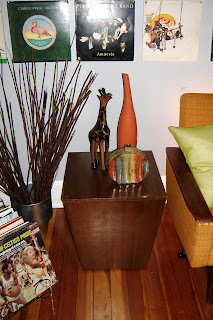 Super finds: the end tables double as storage cubes! The vases were also a great buy and weren't that expensive at all. The striped vases were $10/each! 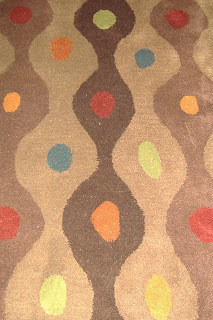 Had to go back for this: at first we bought a cream colored rug with blue and green retro designs. This turned out to be the WRONG choice, so we headed back and switched it out for this one. It just happened to have the exact colors of the room in it! I can't WAIT for this room to be finished. It's might replace the dining room as my favorite room!